My husband’s FAVORITE meal is rice and beans. I don’t make them as often as he would like, so this was his Valentine’s Day dinner request with breaded pork cutlets (I will share that recipe tomorrow). 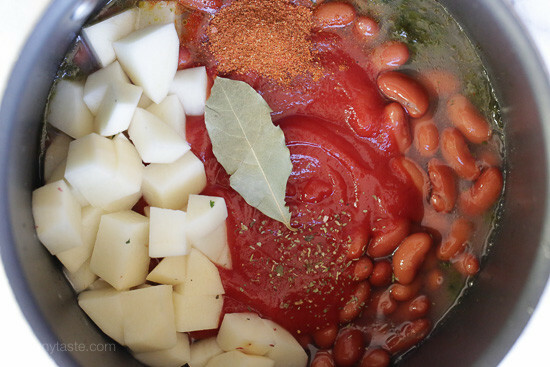 This is my quick version of Puerto Rican style beans, which I make with either pink or red canned beans and diced potatoes, perfect when you need a quick side. I originally posted this back in 2009 (original photo below made with pink beans) and took the opportunity to reshoot. We serve it over white rice but it’s also great over brown as a side dish to chicken, pork chops or steak. 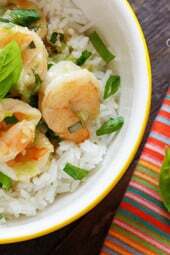 You can easily make it a meatless main dish, served over rice with avocado (and some hot sauce!) and call it a meal. I usually have sofrito in my freezer, I make big batches of it for beans and other dishes. Here I scaled it down to make an exact amount, but if you have your own homemade I use 1/4 cup. 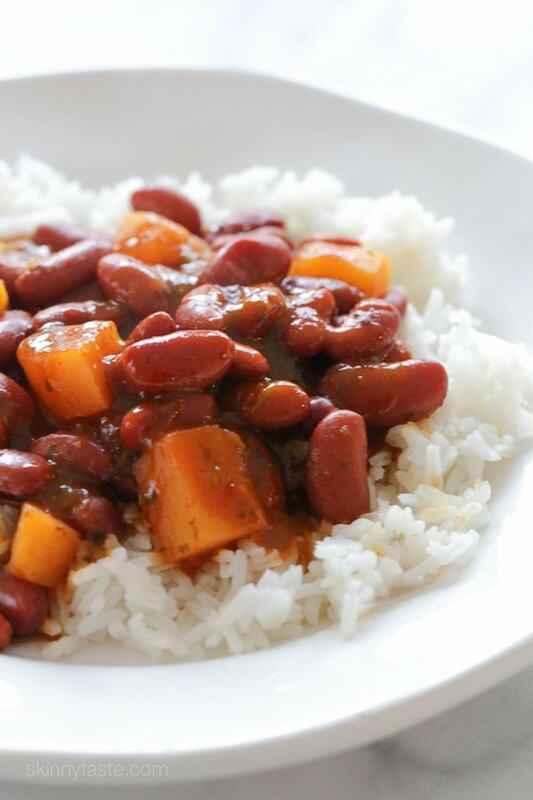 This is my quick version of Puerto Rican style beans, which I make with either pink or red canned beans and diced potatoes, perfect when you need a quick side. In a mini food processor, chop onions, garlic, pepper and cilantro. Add oil to a medium saucepan and sauté the chopped ingredients, cook on medium heat until soft, about 2 minutes. Add the beans (not drained) to the saucepan along with 3/4 cup of water. Add tomato sauce, potato, sazon, bay leaf, oregano, salt if needed and pinch of black pepper. Bring to a boil, then cover and simmer on low for about 20 minutes, or until potatoes are soft. Discard bay leaf and serve over rice if you wish. I love this recipe, it is on rotation in our house! I make this with Gina’s pork chops with limes. So good! Hello, i want to make this and the picture shows green olives but they aren’t listed in the recipe? Made this today! Loved it! USed my pressure cooker (8qt). It was a little watery? Is this normal? If you like it thicker you can use less liquid. If I use store bought sofrito, how much of it do I use?? BEST AND EASY PR BEANS EVER! Yummy! I made this tonight and only added more seasoning due to using three cans of beans but wow full of authentic Puerto Rican flavor! I will use this again! This was soooo good. Made the Sazon for it from this site as well. Sooo flavorful and easy. And full of highly health benefiting spices. Thanks! Growing up, Mom used diced pumpkin instead of potato. Game changer!!! Makes the bean sauce so creamy and added a flavor boost. 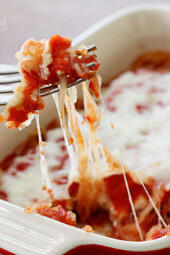 I have made a lot of Skinnytaste recipes…this one is hands down my family’s favorite. The spices and seasonings are perfect. Thank you! Sorry – if I took a second to read I would have easily found my own answer. I made this recipe in my instant pot and it was fantastic! Made this, the pernil, and white rice for my book club last night and everyone loved it. The beans remind me of my mom’s cooking. Thank you for your easy and delicious recipes! Love the recipe, can’t seem to get the sauce to the consistency in the picture. Is the pot supposed to be partially covered? These are so good! I make them with a copycat Pollo Al Horno recipe from a local restaurant, and they are amazing. Hi Gina, as always, another wonderful recipe. Our New Year’s dinner was pernil, your Latin Yellow Rice and these beans. My father-in-law is Puerto Rican (from the Island) and thought these were great! Thanks again for all you do to make the weight loss journey tasty. What is a cubanelle banana pepper? Hi Romie, maybe this will help. yum, so so good! My Jewish husband, who is not the least bit crazy about Latin food, had a grandma from Spain and said these were amazing, just like grandma’s rice and beans. This will be on repeat, as so many of your no fail recipes are in our home. The picture looks more like 1.5 teas vs. 1.5T of sazon. Are you sure it’s 1.5 T? Also if you wanted to use Goya Recaito– how much of it would you use instead of the fresh sofrito you listed? Thank you! The flavors in this are amazing, but it is a little on the salty side (even with homemade Sazon). My main problem was that the potatoes did not get soft enough. I cooked it longer than 20 minutes, at least 30, but some of my potato cubes are barely cooked. Next time I’ll dice it very very small. My husband is Puerto Rican and always wants Puerto Rican food like his family would make, though he does not know the recipes himself. I found this recipe on one day and made it for him. and he LOVED it, he even said it’s better than he mom’s habichuelas. I have made it several times since. This recipe has definitely been a livesaver. Thank you! I made this for the second time tonight. It is absolutely delicious! Great for HCLF vegans, too. Just use water or veggie broth instead of oil with the sofrito. Turns out wonderfully. Hi there, I found your blog by Googling “Puerto Rican Rice and Beans” because I was really having a craving. I admit, I wasn’t so interested in “skinny taste” but I made this recipe last night anyway. It was SO delicious that you’ve totally won me over! Lol, I am glad to hear it! I have lived in Puerto Rico and this really looks good. My husband raved over this, more than anything else I’ve made in at least 6 months. I served it as a side to your garlic-lime pork chops, and at least twice he told me he would eat the beans as a meal. (A meatless, bean-based meal is unheard of in this house.) He even told me I should share the recipe with his sister. Needless to say, this will go into the regular rotation! Made this last night and LOVED it! Used a sweet potato instead of regular since it was what I had and it was perfect. We had it with cilantro lime rice and a dollop of guacamole on top. 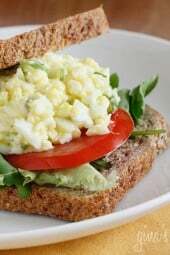 This is a great go-to meal since it utilizes many pantry and fridge staples that I always have on hand. Came together about as quickly as it would have taken to order and pickup takeout food! Definitely throwing this into our meal rotation. So cost efficient too! This recipe is plate-licking good!!!! I followed the recipe exactly and it turned out amazing. It will definitely be in our regular meal rotation. Thanks for making our bellies happy, Gina! This was Delicious!! Even picky boyfriend loved it! Thank you! Made this as a side dish to your breaded pork cutlets with lime. After every bite, my husband sighed, "This is SOOOO good!" Now he and my son are fighting over leftovers! Obviously, this was a big hit! Frankly, the recipe here calls for a high sodium content. This is due to the MSG that exists in commercial sazon, the gum in Goya tomato sauce, as well as the water solution in the canned beans (also injected with MSG). Opt for dry beans, rinse, and cook with homemade sofrito (without MSG) or any tomato base sofrito, make your own sazon, and use kosher salt instead of deriving sodium from the aforementioned products. I made these last night but used a sweet potato, they were fantastic. I really have to try these this weekend. I'll make them and let you know. So good! I had some left over brown rice as well as a little bulgur/cracked wheat (1/4 cup) that I added. Came out wonderful! Sazonador Total from Goya, can that be a substitute for the homemade? Or will it not end up tasting the same? Have you made worth dry beans? This recipe is scrumptious! I substituted an Anaheim chile for the banana pepper and served over white rice as a complete meal. The seasoning and the sofrito really take it to another level, but you still can't beat how cost-effective and easy it is to make. I'll definitely be cooking this again. I made this for dinner tonight. And my Puerto Rican husband LOVED it. My 15 month old son who is so picky lately ate THREE servings! Thank you so much for sharing this recipe on Instagram recently. I'm so glad I saw it! This will definitely make it into our dinner rotation! Made this for my daughter who doesn't eat meat & it was delicious. Paired it with cilantro lime rice along with garlic broccoli. Next time I will prepare more sauce so the rice can really soak it up! Another favorite. I made your recipe for Sazon too. I am so happy to know and use other flavors now. I used some mashed acorn squash to use as a base for my beans. My husband had the rice. Thank you! …what is the sofrito for? When does it get added? Am I missing something? You start with the ingredients for the sofrito and then add everything else. If one is going to substitute a Banana pepper for the Cubanelle, one must make absolutely sure that the Banana pepper is a sweet type. They come in both hot & sweet varieties, & the hot ones can be searingly hot. made this for me my boyfriend and my roommate tonight!! It's hard to cook things that college kids love so this was definitely a winner! I made this from your archives a few months ago! Super yummy! This looks absolutely delicious and spicy..Great way to start week.!! fresh, or a cubanelle pepper. If I were to use jarred Sofrito, do you know how much I would need? Also, can I leave out the cubanelle pepper, or replace it with something else? I just made this to go with Skinny Roast Pork and it was fantastic. I left out the potatoes to save a point. The unique spices and ingredients are essential to this recipe. I will definitely make this again. Thank you! This recipe looks amazing. I have never used potato. I'm from the Caribbean and we always use pumpkin instead of potato. It is AMAZING. You should try it sometime! I make this all the time, I'm Puertorican. I suggest you replace the potato with pumpkin, and add some cumin powder. I belive the PPV goes down for the replacement of pumpkin.! !BUEN PROVECHO!! Started weight watchers but i dont have a book to translate my favorite foods like bacalo con viandas or arroz con pollo into points,please help where can i get this information. I just made this tonight. It is DELISH!!! Thanks for the recipe! I LOVE all of your awesome Latin and Caribbean rice and beans recipes. 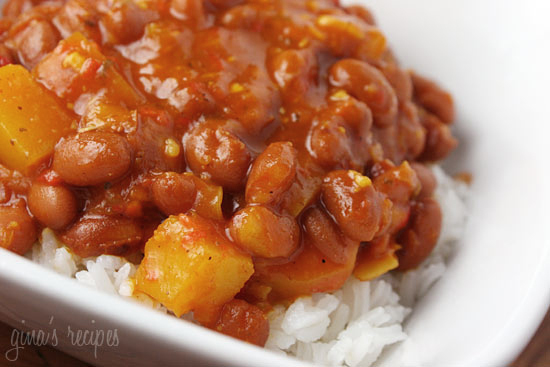 This one is my boyfriend's favorite, but when I made this–and the rice with pigeon peas recipe, too–I found the Sazon to be a little too cloying/salty to really enjoy it. (Very sad!) Can you recommend some seasonings to make a homemade substitute for Sazon? One word- YUM! My Husband loved this. Tried this one out today. I knew I was going to love it but didnt realize how much until I took that first bite. Delicious! I am making this for my sister and myself tomorrow night. I love this website and have found that I really really like Latin food. I like being able to come to this site and find something tasty, nutritious and NEW! I get so tired of the same ole thing all the time. That's what makes sticking to healthy foods/diet difficult for me. Thanks to your recipes I am finding a whole new world of tasty and good for me dishes. Just a question, would this be a complete meal served with some brown rice? Or would white rice be better? I know the point value is different. Beans are so good for you, as long as you don't use a ton of fat to cook them, you are good! Email me your bacalao recipe, I'll see if I can lighten it. My husband will be happy to eat this one! made this with white rice and your empanada recipe, great combo. you know what i like about this one? nothing is different from how you would normally make this. besides the bay leaf, which is just a herb and adds nothing calorie wise, this is exactly how i make my PR beans. so this style of making beans is just naturally low in calories, who'd a thunk?! have you ever made or tried verduras con bacalao? i would love to make this one low in calories or points. I made this tonight! Excellent! i have tried many recipes off of Gina's Blog and so far no disappointments … these beans were amazing!!!! I made them with the string beans in garlic and the Tilapia Oreganata… so freaking good… I'm addicted to this site! Gina – Your family is so lucky to have you cooking for them! All the recipes that I've tried from your website are so delicious that it's hard to believe that they are healthy too. But the thing I appreciate the most is that they are quick to prepare! These beans are fabulous and I feel like I'm cheating on my diet since they are only 2 points a serving. Thank you again!!! They sell pink beans in my regular supermarket, Stop and Shop and Pathmark. I would think you can find them anywhere. Gandules are pigeon peas so next time see if you find it that way. Sazon is a seasoning used on meats, fish, poultry, beans and even to flavor soups and stews. Typical ingredients include cilantro, corriander, annatto, azafran, achiote, garlic, onion or salt. Some brands contain MSG so check labels. I buy Badia Sazon Tropical because it has no MSG. It is found in the Latin or Mexican aisle. I love Puerto Rican rice and beans!Can I find pink beans at the regular grocery store? I know that I have never been able to find gandules unless it’s at a latin market.Thanks for all of the wonderful recipes! Actually, it's a seasoning mix used in most latin and caribbean cooking, especially Puerto Rican and Cuban. It's a combination of salt, garlic, cumin, anatto and other seasonings. Usually comes in the international aisle near the mexican seasonings. Accent is a very common brand name, but Goya has some as well.